Shortly after I moved into my house in Maricopa, AZ nearly 5 years ago, I was working on installing a new drip irrigation system. Our yard was just dirt (literally! ), as were most of our neighbors at that time. While testing the system a bit of water squirted out. And within a few minutes, I noticed a beautiful green bug landing to sip some of the water. Amazed that a bit of water would attract a bug so quickly, and surprised by its metallic color, I grabbed my camera and was able to snap a quick photo. This bee is an Agapostemon tyleri (or perhaps Agapostemon melliventris) but definitely an Agapostemon. The photo just wasn't sharp enough to get the details needed for a clear identification. 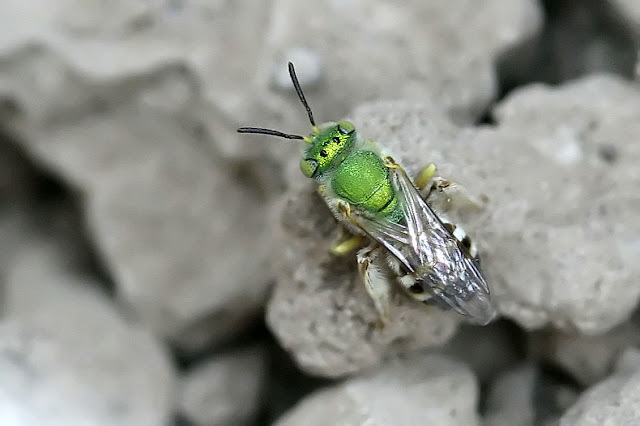 These bees nest in the ground, usually solitarily in vertical burrows. In the summer I can usually locate about 6 to 12 burrows on my yard, most of which are very near flowers. (And this is good news because I'd really like to get some better photos of them). I've had a surprisingly difficult time finding detailed life history on these bees - it just goes to show how little is documented (or documented in easily accessible forms) in the bug and insect world. That is one super cool looking bee! Wow....I've never seen such a closeup view of this stunner!! Great close up of something I've never seen. Boom & Gary of the Vermilon River, Canada. Incredible. Hard to believe it isn't a mock up or a piece of jewellery. Does it favour particular plants? Wow, it looks like a piece of jewellry, terrific shot. Lovely. Never seen a bee like that. WOW.. What an amazing shot.. I love it..
All: Thanks for the comments. Jo: From what I've seen and read, it doesn't seem to favor any plant in particular. However, I do have a high percentage of natives in my landscape, so perhaps that helps.